Follow our live online coverage as Parliament returns from prorogation with a throne speech to open the new session. The government will "continue to ensure that our natural resources sectors remain open to foreign investment when it is market-oriented and in the long-term interest of Canadians." A promise of new patient safety legislation to "help identify potentially dangerous drugs, and ensure the quick recall of unsafe drugs." More health issues mentioned in the speech: more affordable adoption, renewed investment to research dementia and related conditions. On railway safety, requirements for shippers and railways to carry additional insurance and "targeted action to increase the safety of the transportation of dangerous goods." "The Government continues to believe the status quo in the Senate of Canada is unacceptable. The Senate must be reformed or, as with its provincial counterparts, vanish. The Government will proceed upon receiving the advice of the Supreme Court." Cet « instrument » prend la forme d’une série de proclamations du gouverneur général, faites sur la recommandation du premier ministre et publiées dans la Gazette du Canada. Le jour de la dissolution ou de la prorogation du Parlement, une proclamation fixe la date à laquelle le Parlement est convoqué. Conformément au principe de la continuité du Parlement, selon lequel une session se termine en prenant des dispositions pour la suivante, la proclamation se fait à la fin d’une session. Une deuxième proclamation confirme ou modifie cette date et peut fixer l’heure à laquelle le Parlement est convoqué pour « l’expédition des affaires » (on pourra avancer ou repousser la date par la suite). On procède à une troisième proclamation si la deuxième n’avait pas annoncé l’heure à laquelle le Parlement était convoqué. Parliament begins each session with a day of stately pageantry that includes a speech by the Governor General (or the monarch if they are in Canada) setting out the government’s agenda and priorities – and summoning parliamentarians back to work. The Speech from the Throne is almost always delivered mid-afternoon. But the October 2007 address was held at 6:35pm ET. Amidst heightened election speculation, critics accused Prime Minister Stephen Harper and the Conservatives of reducing the opposition’s ability to respond before that night’s newscasts and newspaper deadlines. Le discours du Trône est presque toujours prononcé au milieu de l’après-midi. Toutefois, le discours d’octobre 2007 a eu lieu à 18 h 35 HE. À un moment où les rumeurs abondaient quant à l’éventuel déclenchement d’une élection, les critiques ont accusé le Premier ministre Stephen Harper et les conservateurs de réduire le temps de réaction de l’opposition avant les heures de tombée du téléjournal, du radio-journal et des quotidiens. The royal representative almost always reads the Speech from the Throne. Sometimes the monarch performs the duty themselves. King George VI read the 1939 speech during a pre-war visit to Canada. Queen Elizabeth II did the same in 1957 and 1977. Whether a king, queen, or governor general delivers the speech, its text is entered onto parchment and presented to the Crown by the Speaker of the House. Il en revient presque toujours au représentant du monarque d'effectuer la lecture du discours du Trône. Il arrive parfois que le monarque effectue cette fonction lui-même. En 1939, le roi George VI a procédé à la lecture du discours au cours d'une visite royale d'avant-guerre au Canada. La reine Elizabeth II en fit de même en 1957 et en 1977. Que le discours soit prononcé par le roi, par la reine ou par le gouverneur général, une copie spéciale est imprimée sur papier parchemin et présentée à la Couronne par le Président de la Chambre. The government writes the speech, which MPs debate for up to six days after returning to the Commons. The process begins with a motion by two government backbenchers to consider an Address in Reply: a short statement of thanks to the Governor General for providing the speech. Debate begins with “Leaders’ Day” and a speech by the leader of the opposition. By tradition the prime minister speaks next, followed by the other party leaders. In 1984 the Montreal Gazette said the event might have “mystified Canadians watching the event on television." In fact, these traditions trace their lineage back to 16th-century England. The Usher of the Black Rod and Speaker of the House lead MPs to the Senate chamber for the speech, since the Governor General or the monarch is not traditionally allowed inside the House of Commons. 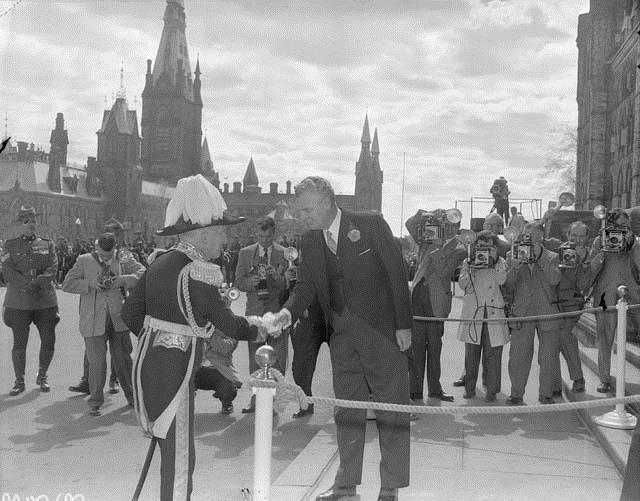 The Governor General, meanwhile, leads a ceremonial procession from Rideau Hall to Parliament Hill. One tradition remains peculiar to the Palace of Westminster in London, though. The cellars there are searched before every opening of Parliament in a ceremonial nod to the foiled 1605 Gunpowder Plot that would have blown up the House Lords and killed King James I as the beginning of a Catholic revolt in England. IN ALL THY SON’S COMMAND? In a surprising announcement during the 2010 speech, the government asked Parliament to reconsider the English lyrics to O Canada that describe “true patriot love in all thy son’s command.” The government backed off the idea after gauging public reaction. The original 1908 lyrics were based on work by R. Stanley Weir and had a gender-neutral tone: “True patriot love thou dost in us command.” The change was made six years later in response to Canadian troops sent to fight the First World War. Liberal Senator Vivienne Poy introduced a bill in 2002 that would revert the official lyrics back to the original 1908 version. A new campaign is underway, spearheaded by Poy, fellow senator Nancy Ruth, former prime minister Kim Campbell, author Margaret Atwood, and Sally Goddard, the mother of Canada's first female soldier killed in combat. Governor General David Johnston has entered the rotunda of the Centre Block on Parliament Hill, greeted by Prime Minister Stephen Harper, Government Senate Leader Claude Carignan, Chief of Defence Staff Gen. Tom Lawson, and RCMP Commissioner Bob Paulson. Johnston will join his procession, which includes the Usher of the Black Rod, secretary to the Governor General, Colonel-in-Waiting, two aides-de-camp, Sheila Johnston, Harper, Carignan, Lawson, and Paulson. Will be interesting to see what lies Harpo has concocted for the speech. won the largest majority in Canadian history, to that point. The procession is now entering the Senate chamber. The justices of the Supreme Court of Canada are present in the aisle, in front of Johnston. The Usher of the Black Rod now proceeds across Centre Block to the main door of the House of Commons and knocks three times. Just love the split screen of both Senate and House chamber on CPAC. Being at home gives a good vantage point. The Sergeant-at-Arms informs House Speaker Andrew Scheer that Black Rod is carrying a message from the Governor General. Watching #SpeechFromtheThrone on #CPAC . It would be very exciting to be in the Gallery. Black Rod asks the Speaker and MPs to "attend" the Governor General in the Senate chamber. We've returned to the House of Commons, where Speaker Andrew Scheer is speaking on Private Member's Business. When MPs rise for the evening, stay tuned for live coverage from the foyer of the House of Commons with Peter Van Dusen and the CPAC team. The House of Commons has concluded today's sitting. Stand by for live coverage from Parliament Hill with Peter Van Dusen as we hear reaction to today's Speech from the Throne. I would like to officially thank @CPAC_TV for existing. Thank you. CPAC French to English translator is giving Mulcair a British accent. This is awesome. Trudeau: speech shows no vision or plan for Canada.